Avenue 29 is a 324-unit Class A apartment community in north Tallahassee, Florida. The property is located in the established and growing north side of Florida’s state capital city and proximate to the city’s best schools. Downtown Tallahassee, the state capital buildings, Governor’s Mall (the region’s largest), Tallahassee Memorial Healthcare, and six additional specialized medical facilities are all found within a four mile radius of Avenue 29. Florida State University and Florida A&M University are both a short drive from the property. The community features a modern clubhouse, Tallahassee’s largest swimming pool, a sundeck, Jacuzzi spa, fitness facility, carport parking for rent, basketball and volleyball courts, game room, BBQ grills, a lounge, laundry facility, a modern business center, and secure access gates . Avenue 29 was originally developed in 2001 as a purpose-built student housing community. However, due to growing demand in the market for conventional housing, a program to convert the property to market rate housing was initiated, but not completed, prior to ApexOne’s acquisition. The apartment homes range from 625 square foot one-bedroom floor plans up to 1365 square feet with four-bedroom. Each residence features a full kitchen with microwave oven, disposal, electric stove/ cooktop and refrigerator/freezer. 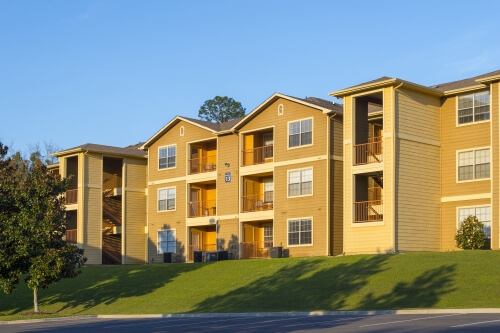 Additional Class A amenities in each unit include energy efficient ceiling fans, washer/dryer, walk-in closets, balcony or patio, mini-blinds, intrusion alarm, storage unit and high speed internet access. An extensive property upgrade program began immediately following closing focusing on enhancing the curb appeal and new interiors. The upgrades will include the renovation and redesign of apartments, clubhouse improvements, and expansion of the community amenity package.